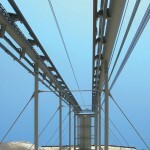 that, along the entire height, serve to hold the guiding tracks for the lift cabin and the counter-weight as well as the pulley in the ‘shaft head’. 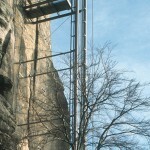 The tubes, set 5 metres in front of the fortress wall, are fixed by means of compression and tension rods anchored in the rock and connecting bridges at the stops. 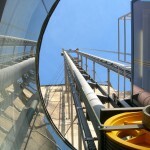 The utmost performance in terms of steel construction lies in the minimal vertical tolerances of up to 10 mm. 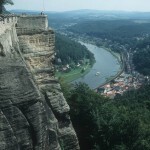 From the glassed-in lift cabin, visitors have a view of the cliffs at the side and the landscape. Reflection-free glass and the minimized structure increase the degree of transparency. A roofed entrance area offers protection against the weather and small-scale erosion of the fortress cliff. The first station is at the level of the emplacements, where the technology of an historic transport lift can still be seen today. 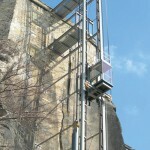 An opening in the fortress wall is reactivated as an access point for the new lift. The existing historic technology is integrated into the design of the museum laid out in the interior. The upper station of the lift serves the fortress plateau at the level of the battlements.